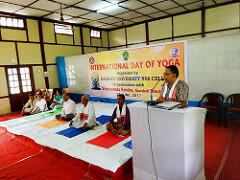 On the occasion of 3rd International Day of Yoga, Vivekananda Kendra Kanyakumari, Tinsukia Branch organized three programs in various locations of Tinsukia Township. At 8:30 A.M. the first program was organized at Women’s College, Tinsukia. 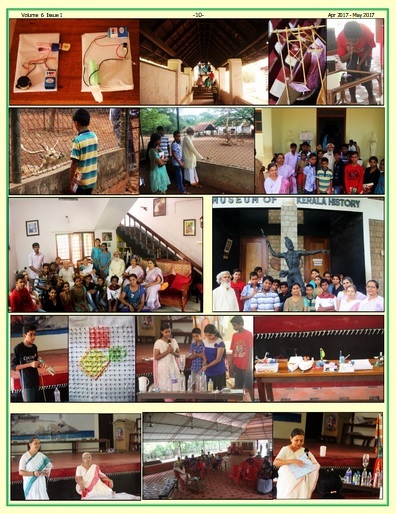 The programme saw the enthusiastic participation of 185 students and lecturers of the college. 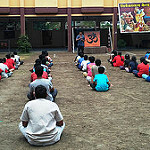 The Yoga session was conducted by L. Sarita, Tinsukia Nagar Sangathak, Vivekananda Kendra. Yoga demonstrations were done by Kumari Najuki and Ravi, Anadalaya Acharyas. The second program was organized at Manav Kalyan Prathana Bhawan, Tinsukia in collaboration with the Institute of Chartered Accountant of India (ICAI), Tinsukia branch. 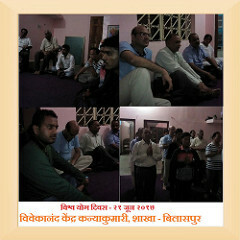 150 persons including the Chartered Accountants, their family members and friends participated in the program. Sri Manish Agarwal, President of Tinsukia branch of ICAI delivered the welcome speech. 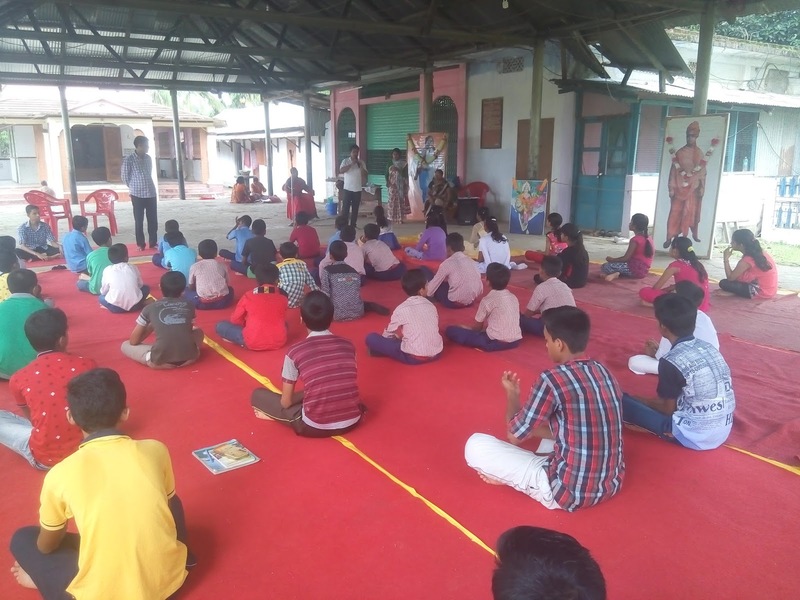 Sri Gurudev Koli, Teacher, VKV, Tinsukia took the yoga session. Ma. Pravin Davolkarji, all India Joint General Secretary of Vivekananda Kendra enlightened the gathering on the topic- Yoga: the way of life. At 12 noon the final program was organized in Tinsukia Commerce College in association with the District Administration, Tinsukia. Sri Partha Pratim Bairagi, ADC, Tinsukia was the chief guest. The Principal, Vice-Principal and many dignitaries from Tinsukia took part in that program. 250 students and lecturers of the college participated in the Yoga session taken by Sri Gurudev Koli, Teacher, VKV, Tinsukia. 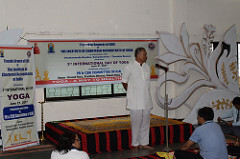 Madurai Celebrated International day of yoga celebrated at 4 place. 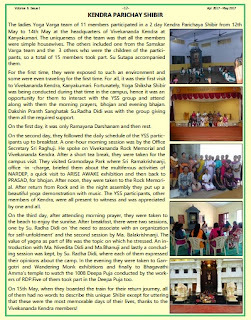 3 Days Residential Youth motivation camp is organised by Vivekananda Kendra Mysore at Kanyakumari from June 6th to June 8th. On 6th June Ma. Balakrishanji, Vice president of Vivekananda Kendra inaugurated the camp and talked about Vivekananda Rock Memorial and Ma. Eknathji. The topic Purposeful Life by Ma. 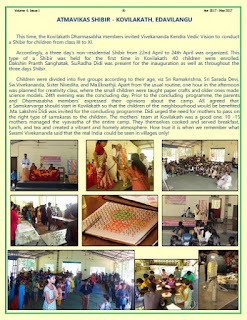 Radha Didi, Pranta Sanghatak and interacted with students. 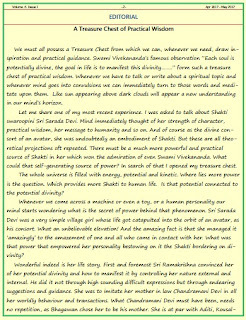 How I inspired by Swami Vivekananda by Sri Raghuji, Bangalore. Patriotic saint Swami Vivekananda and Karma Yogini Bhagini Nivedita by Sri Vinayaka, Yuva Pramukh, Vivekananda Kendra, Mysore. Su. Kalyani Didi took song session. On 8th June , Ma.Aparna didi, talked about Kendra and how students can associate in Kendra activities. 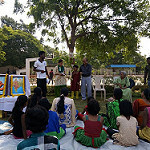 Prayer, games , group discussion, Shramanubhava, yoga and pranayama are the other activities.All the participants visited Rock memorial, Sri Ramayana Dharshanam, Bharatamata sadhan, other exhibitions the campus. 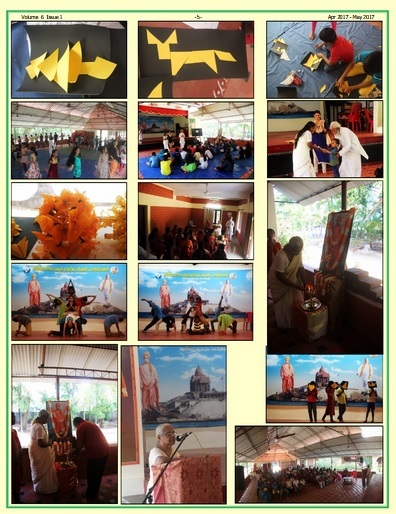 Total participants 40, teachers-3, karyakartas- 7.
about Bhagavata during Saptaha. 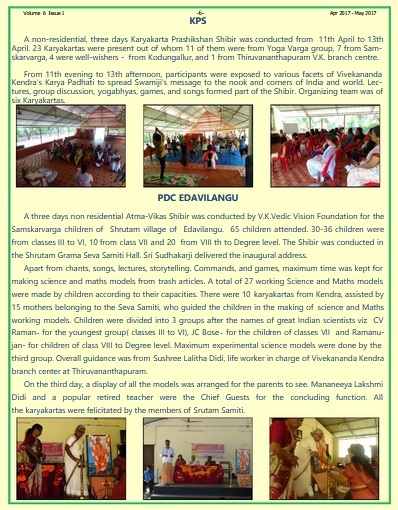 Programme was concluded on 15 June 2017. 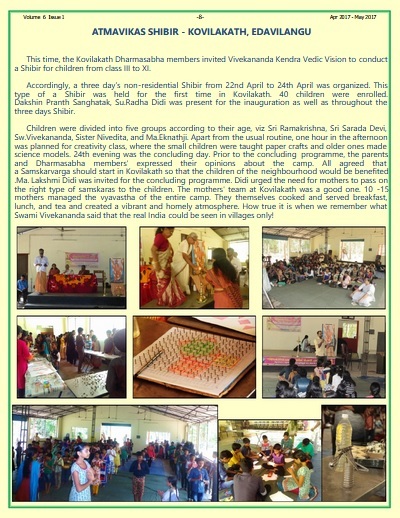 Around 100 people partook the prasad. Su Radhamma from Thiruvananthapuram sponsored the entire programme. 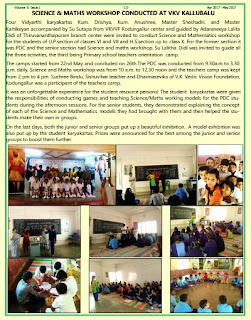 A 5 day non-residential Personal Development camp was organized by Vivekananda Kendra Vidyalaya, Badarpur at Anandadham Kalibari, Badarpur, from 23rd May’17 to 27th May’17, where 42 students attendend. Apart from VKV Badarpur, 5 other school student also participated in that camp. The program was inaugurated in the presence of Sree Chinmoy Boruah dada, Nagar pramukh, Badarpur, Sree Niharanjan Das Dada a teacher of Maharshi Sandipan school and Sree Prashanta Chakraborty Dada Headmaster VKV Badarpur. Every day from 9:00 am to 3:00 pm different activities started from Pratahsmaran to Kendra Prarthana, along with various Boudhik satras, Manthans, Karyashalas, Yogabhyas, Geetabhyas and sanskar Varga were followed. On 27th May’17 at 2:00 pm the Samarpan samaroh was followed in presence of various dignitaries and parents of those students. The dignitaries were- (1) Sree Ahindra Das, teacher of Rly High school, (2) Sree Shitish Ranjan Das, Headmaster of Pramodini Vidyanikitan School,Kalinagar , (3) Sree Bishwa Baran Boruah a senior Advocate of Karimganj Judge Court. 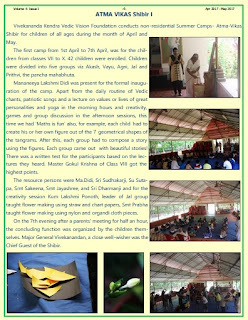 All of them were very happy for those steps taken for the children and have put light upon the importance of those camps and those habbits that build our character. The program concluded with Kendra Prarthana. Vivekananda Kendra Kanyakumari organized 193rd Free Eye Camp on 7th June 2017 Wednesday from 9:00 a m to 3:00 p m in Vivekanandapuram Campus.​ This Eye Camp was ​Sponso​​r​ed by​ Smt S Shankary (In memory of her husband late MGS Shankar) of Tirunelveli. 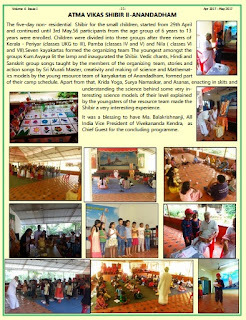 The Camp was inaugurated by lighting the lamp by LifeWorker, Kum. 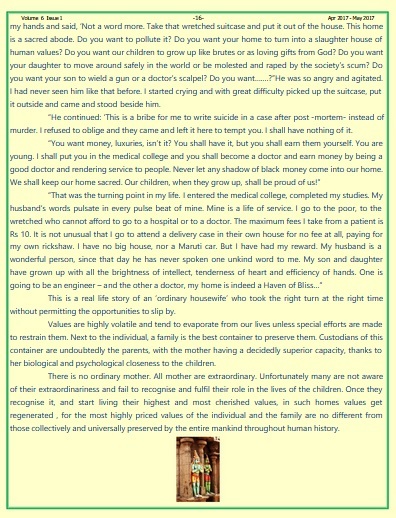 Aparna Palkar in presence of Dr. Sneha & Dr. Pradhan of the Aravind Eye Hospital, Tirunelveli. Including Doctors total 15 member of Medical Team has conducted the camp. 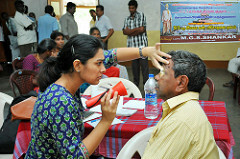 They checked up more than 180 outdoor patients, from which 38 patients have been sent to Tirunelveli for Operation and with this free Spectacles and post operative medicine were distributed to Eye Patients at Vivekanandapuram campus at Vivekananda Kendra, Kanyakumari. Free Eye Camp was organised every first Wednesday morning of every month at Vivekanandapuram Campus at Vivekananda Kendra, Kanyakumari. 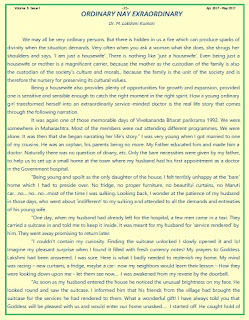 One can contribute his service or sponsor a Eye Camp. 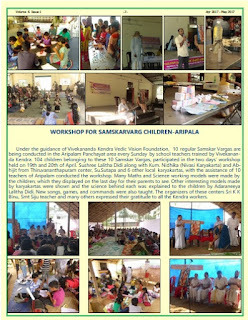 Plz drop an email to dona...@vkendra.org to get more details. Sustainable Electricity Access - Some Thoughts by Dr.Ramarathnam of Basil Energetics. 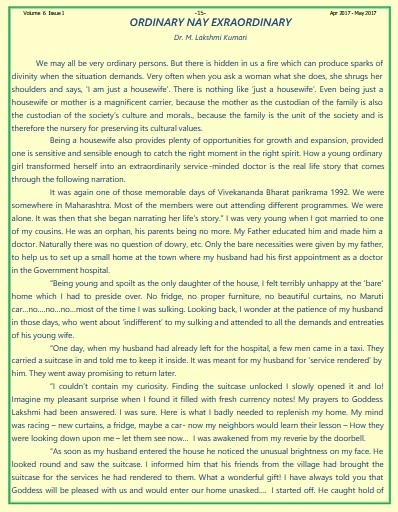 Shri.Subramanian of C.P.R. Environmental Educational Center writes about Nakshatra Vanam. 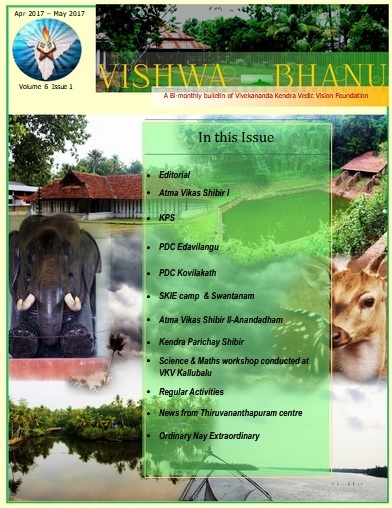 This month he gives the details of Shathabhisha Nakshatra. Albert Schweitzer, a Nobel Laureate was a French-German theologian, organist, philosopher, and physician. He coined the phrase “Reverence for Life”. These words came to Albert Schweitzer on a boat trip on the Ogooué River in French Equatorial Africa (now Gabon), while searching for a universal concept of ethics for our time. Schweitzer made the phrase the basic tenet of an ethical philosophy, which he developed and put into practice. He gave expression to its development in numerous books and publications during his life. He also used his hospital in Lambaréné in Gabon (Central Africa) to demonstrate this philosophy in practice. In this month, we are giving a few of his quotable quotes. Shri.N.Krishnamoorthy covers the topic of ‘Green Diversity’ by way of dialogue between Srimati Annapurna Duval, Shri Krish Phidal and Professor Jnani Noval. In happenings section, we have covered training programmes on Vermi Technology, Bee Keeping, Water management, Bio-methanation technology, Refresher course and Exposure visits etc. 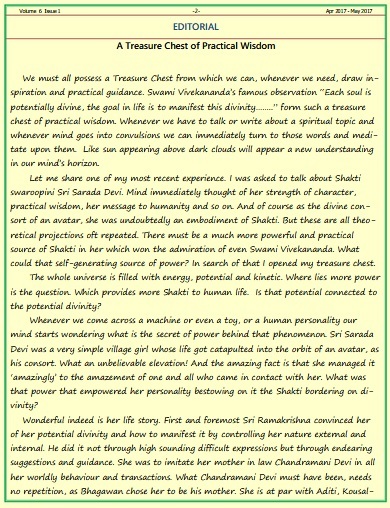 In the wisdom section, Wolfgang Sachs, Editor of ‘The Development Dicitionary’ writes about the dilemma of the human being between Tradition and Modernity while Jean Robert, a Swiss Architect and writer of ‘The history of modern consciousness’ explains how the Development is directly proportional to the degradation of environment and finally Dr.Vandana Shiva in her usual style explains the Crisis of sustainablilty. For reading the newsletter, please click here. 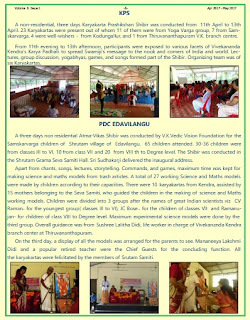 Vivekananda Kendra Nagarkoil conducted one day Personality Development Camp at 5 place in Kanyakumari, 200 children participated in camp. 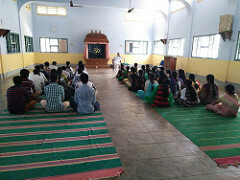 There was 5 days residential personality development camp in kanyakumari of selected 55 students. 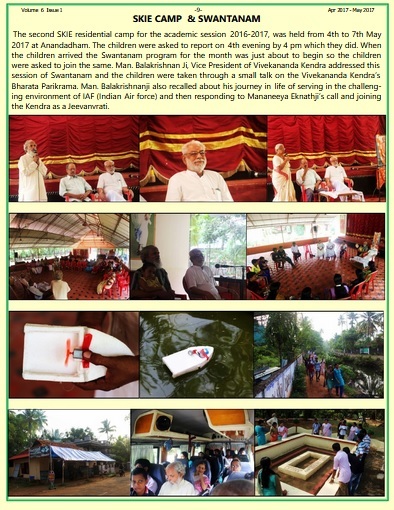 Adaraneeya Radhadidi and Sri ParameswariMataji of Sharada Ashram concluded the camp with Paadha Poojai and Prarthana for Rain. Around 45 parent Participated in the Poojai and altogether we chanted for Rain. Vivekananda Kendra Kanyakumari Kovilpatti Branch conducted 7days yoga satra at Kovilpatti Nadar Kamraj Metric School from 21st to 27th May 2017. 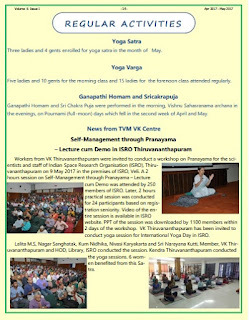 Participants learn about Relaxation Technique, SuryaNayaskar, Assan, Pranayam and also get first hand experience of Neti​ ​Kriya. 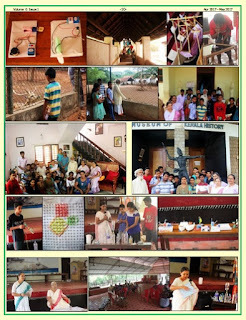 Total 45 person encouragingly took participation in all the activities. Vivekananda Kendra Kanyakumari in association with Lion K.K.Saharia Eye Hospital, Dibrugarh and Jatiya Vidyalaya, Pengeree organized one Free Eye Camp at Pengeree on 30th May 2017. A total 107 patients were examined by the eye Hospital team and 23 patients with cataracts were detected during the day long camp. The patients with cataracts will be operated phase wise and the first batch of 8 patients will be operated tomorrow. The transportation, food, hospitalization, medicines and surgery for each patient will be free of cost. 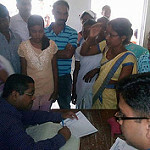 Patients from many interior villages and tea gardens were immensely benefitted during the camp. The owner of Jatiya Vidyalaya, Pengeree, Sri Kuldeep Sharma donated 36 spectacles to the poor and needy patients during the camp. The Indian Army unit, stationed at Pengeree provided refreshments to the medical team.